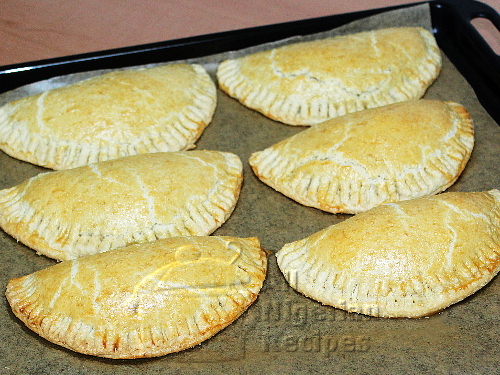 Coconut Meat Pie is a tropical version of our trademark Nigerian Meat Pie, this time bursting with coconut flavours. Everywhere you look in this pie, there is coconut flavour. With the following ingredients, I got 6 coconut meat pies. Please note that I used a cutter that is 14cm (5.5 inches) in diameter. The size of your cutter greatly affects the number of coconut pies you will get. Click images to enlarge. You will need a circlular cutter or a sharp pot cover that can cut dough. 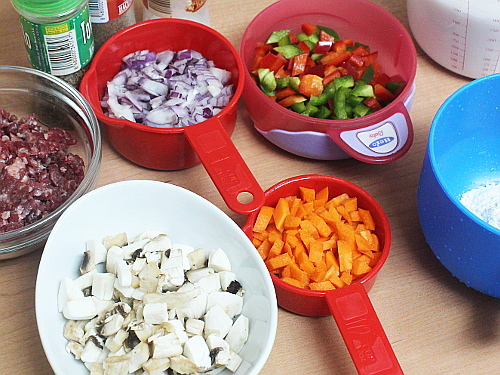 Chop all the ingredients as shown in the image above. Mix the plain flour for the filling with a small amount of coconut milk to get medium consistency. This is the thickener. Pour the coconut oil into a clean dry pot and set on the stove to heat up. When hot, add the chopped onions and fry for 1 minute. Add the minced beef and fry till pale. 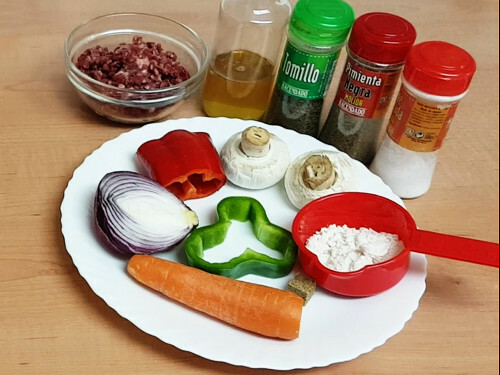 Separate the beef mince as you fry so that they will not clump up. Add stock cube (crushed), thyme, black pepper and salt. Add the coconut milk, chopped carrots and mushroom. Stir, cover the pot and cook for 1 minute. Add the chopped red and green bell peppers. Add the thickener, stir, cover and leave to simmer for half a minute. Stir and set it aside to cool down completely. Sift the plain flour into a clean, dry, sizeable bowl. Add the coconut flour, baking powder and salt. Mix very well. Add the butter in small scoops. 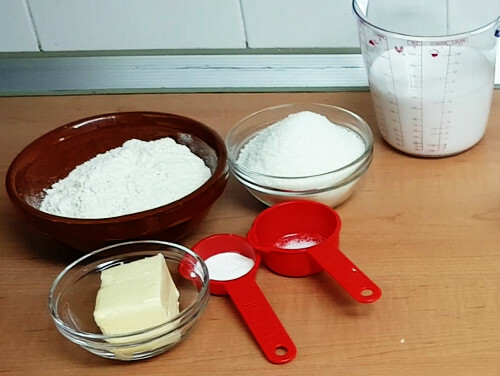 Gently rub the butter into the flour till the mixture feels like crumbs. Add the coconut milk. Mix and knead till a ball of dough is formed. Knead well, cover and set aside to rest for 10 to 15 minutes. After 10 to 15 minutes, knead the dough again till very smooth. 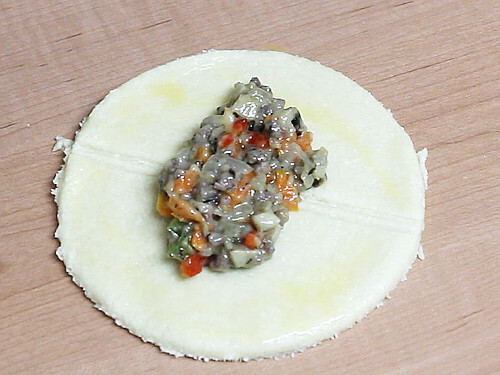 Roll out the dough to about 5mm thickness. Cut with the cutter, rub the beaten egg around the inside of the edge of the circlular dough. Scoop some filling onto the centre. Close and seal with a fork. Place in an oven tray that is lined with a baking sheet. In the absence of a baking sheet, rub some butter inside the tray. 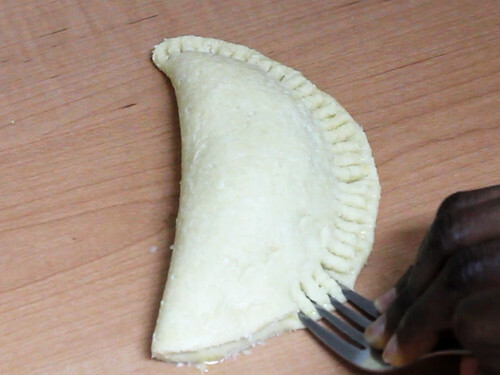 Rub the egg on the coconut meat pies. This is so they will be golden when done. Bake in a preheated oven at 170°C (350F) till golden. This takes about 40 minutes in my oven. Your own time will depend on the type and heating capacity of your oven.